Massacre in the Kyrgyz village of Aksy (Jalalabad region) six year ago keeps fomenting unrest and conflicts between society and the regime even now. It is the so called Aksy Question that may disrupt fragile political stability in Kyrgyzstan. Special forces of the Interior Ministry mowed down peaceful demonstrators marching to support lawmaker Azimbek Beknazarov facing trial in the town of Kerben. (Beknazarov was protesting Bishkek's intention to turn over some Kyrgyz lands to China.) Six demonstrators were killed, nearly twenty wounded. It happened in the vicinity of Aksy on March 17, 2002. Radical Kyrgyz opposition headed by erstwhile Prosecutor General Beknazarov expects resignation of the president by March 24. Alternative power structures (analogous to what was established during the revolution in March 2005) are organized in the southern regions of Kyrgyzstan. A nationwide kurultai or congress is scheduled to take place in Bishkek on March 29. Kurmanbek Bakiyev's political enemies are expected to make some vital decisions there and, hopefully, nominate a single candidate for president from the united opposition. There will be more than rallies and congresses this time. Intent on organization of their own trial, residents of Aksy are mailing unofficial summons to "suspects". The trial will take place in the settlement of Bospiyok (where demonstrators were mowed down) on March 17. Residents of Aksy are out to bring to answer ex-president Askar Akayev, current President Bakiyev, officials of the Jalalabad regional administration, and senior officers of law enforcement agencies who held their positions in 2002. The local authorities are seriously upset. Revolution in March 2005 began precisely in Jalalabad whose population set up alternative power structures that challenged Akayev's regime. Question: The kurultai [an alternative to whatever congresses the official authorities organize] is scheduled for March 29. Your promises to force Bakiyev to resign presidency are well known. Does it mean that Bakiyev will already be an ex-president in time for the kurultai? Azimbek Beknazarov: We'll wait and see what he has to say on return from Germany on March 24. [The president took a short leave of absence on March 3.] I'm surprised that he chose to leave the country in this furtive manner at all. Bakiyev's advisors are Jews from the West (most of them are). It's them who have been running things in Kyrgyzstan via Maxim Bakiyev. As for Bakiyev the president, he will probably return with something new to suggest. Question: Alternative power structures from the parliament to courts are being established throughout the country. Will there be an alternative president as well? Is there one already? Azimbek Beknazarov: I do not rule out the possibility that the kurultai will vote for it on March 29. The kurultai wields these powers, you know. I cannot say exactly what decision it will make. Let the delegates decide. Azimbek Beknazarov: We were noticeably less radical then. Even our own comrades criticized us when we overrun the Jalalabad regional administration on March 4, 2005. No more discord. All structures of the opposition are unanimous and monolithic, these days. Question: Is it correct to assume that the forthcoming kurultai will mark a new period of consolidation of the opposition? Azimbek Beknazarov: Actually, we've already taken the first step. Provided Bakiyev declares a snap presidential election, the kurultai will offer us an opportunity to nominate a single candidate. We should be prepared. The time to act will come after March 29. Question: You were in charge of the crowds that seized the government building in March 2005. Nothing prevented you from seizing state power then but you decided to elevate Bakiyev to presidency instead. You are one of his staunch critics, these days, but Bakiyev is your responsibility, isn't he? Azimbek Beknazarov: He is. I apologized to the people for it in 2006. My fault indeed. Kubatbek Baibolov and others kept telling me to assume national leadership then, but I was imprisoned, and therefore couldn't take the advice. In any case, I kept my word. We had made a pact in spring 2005 to back the sponsor. The Bakiyevs financed protests in Jalalabad in spring 2005. So, when Akayev fled the country, I put Bakiyev in front of crowds and he swore in public that he would never permit his brothers and children in the corridors of power. I trusted him. It turned out to be a mistake. Question: The events in Aksy consolidated the opposition once and Akayev's regime was toppled. Do you think this "people's trial" scheduled to take place soon will unify the opposition now? Azimbek Beknazarov: The events in Aksy elevated Bakiyev. After the revolution, I accompanied Bakiyev on a trip to Aksy where he gave the people a solemn promise to investigate everything. 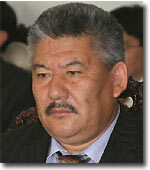 Aksy cost Akayev presidency after 3 years. Well, another 3 year period passed now. On March 17, the people's trial will plainly demonstrate the lack of trust in the authorities and in the state where all structures are run by a single family. It is common knowledge after all that all security structures are in the hands of the president's brother Zhanysh. If the state is like an auto, then installing a new driver is all we have accomplished so far. Not even the Akayevs were so obvious and shameless. Maxim Bakiyev was installed in Aidar Akayev's office. One son of the president replaced with the son of another. On the other hand, state officials did not hurry to Aidar with regular reports then the way they do nowadays and report to Maxim. It pains me to call us revolutionaries. The revolution took place on March 24, but three days later it was over. It stopped being a revolution. Question: Do you think you've learned from the past mistakes? Azimbek Beknazarov: I hope so. At the very least, we've taken them into account. Back in 2005, we were united by a common purpose. We wanted Akayev out. The worst shortcoming, however, was that we lacked a team. We wagered on our ability to reach an understanding once Akayev's regime was toppled. What we failed to take into account was the fact that the Akayevs were stronger. Question: If it is impossible to give any names at this point, could you please at least describe the single candidate for president? Azimbek Beknazarov: We have several potential candidates these days. Negotiations and consultations are under way. The candidate will be elected collegially. We have to convince the people to trust our candidate, that's the priority nowadays. Back in 2005, we nominated the man who had fed protesters. No more. Question: Let's say Bakiyev decides to run for another term of office. Is the opposition confident of its ability to beat him? Azimbek Beknazarov: The parliamentary election in December 2007 taught us to prepare our tactic in advance. We will win the snap presidential election, that much we know. No more waiting for the Central Electoral Commission to count ballots. It will be different this time, not like it was in December 2007 when we decided to wait for the official announcement of the outcome of the election. We are still waiting for it, you know.